“With high summer temperatures and low precipitation predicted for the western provinces this year, there could be record wildfires again like the ones that imposed extensive evacuations on Fort McMurray in 2016. The circumstances of those forced evacuations and the tragedies and stories embedded within cannot be easily told or read but Shari Green, herself an evacuee in 2016, has the voice, the words, and the heart to tell it in her newest middle grade novel Missing Mike…. Missing Mike was…a heartbreaking story to read. Cara’s love for Mike is so deep that her anguish at being separated from him is palpable. She envisions a multitude of scenarios that Mike might be enduring or anticipates where he might be, alternating that distress with reflections on the things she and he did together. 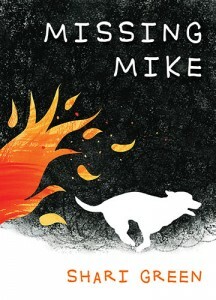 But more than the story about a missing dog, Missing Mike is about home and the different configurations it might take. Cara who spends some time working on crosswords, realizes that the synonyms for home are not always structures. They can be feelings and people and more.